How do I choose not to participate? AVG does NOT currently share any non-personal data collected from any of our apps. If we begin to share non-personal data collected from our FREE apps, you will be able to choose whether you participate in the app itself by setting your own sharing preferences. If there is no option available, then you can be sure that we are not sharing any non-personal data with third parties. We will update this page and provide you with clear instructions on how to set your privacy preferences before any sharing begins. Certain third party services, like Google Analytics, used in our products provide opt outs for tracking and analytics. Please click here for details on how to change these preferences. In order to continuously improve AVG products and services, as well as your experience using them, we will periodically send several types of emails. We work hard to make these emails as useful and relevant as possible to you, and therefore split these mailings into a few specific categories (product alerts, news and tips, special offers, etc.). We will never sell or share your email address with a third party. 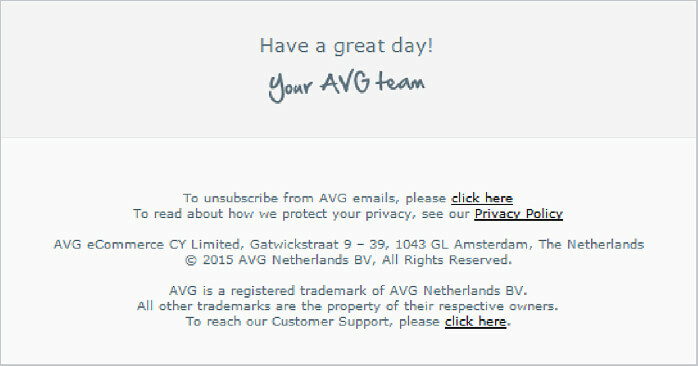 Should you wish to unsubscribe from any (or all) of our email categories, you can do so by updating your AVG email preferences. The options available for this are detailed below. Please note: A small number of AVG account-related emails cannot be unsubscribed from, because they are triggered by actions on your part. These include purchase confirmations and receipts, password reset requests and direct responses from our Customer Care team. Simply uncheck the 'Keep me informed' box and click 'Save Changes'. And if you wish to re-subscribe at any time, just check the 'Keep me informed' box before saving the changes again. The link will take you to a page where you can select the category (or categories) of emails you would like to unsubscribe from. Click 'UNSUBSCRIBE' to confirm.